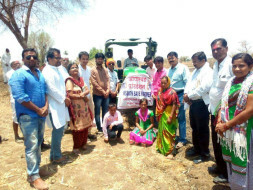 The ‘Aadharwad Foundation’ is a society (Reg. no. Maha-278/16) registered under Societies registration act 1860 established to help poor and needy farmers, especially in the region of Marathwada, without restriction to any cast or religion. It intends to help farmers morally, financially or in any other way, to prevent them from ending their own lives. It assist farmers to learn and adopt new farming strategy, techniques to improve their crops productivity, with reduced efforts. Additionally it also provide financial assistance in case of medical or any other emergency. 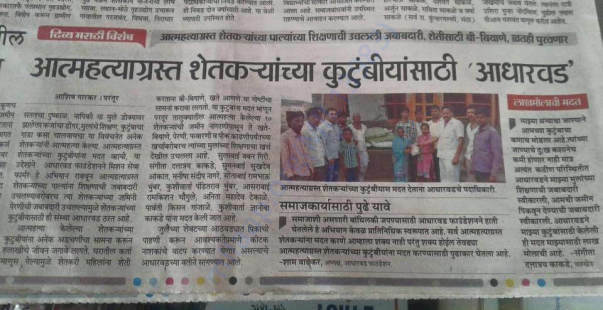 Earlier during December 2014 to February 2015, we started an initiative MISSION SAVE FARMER, and as part of which we have provided immediate financial aid to more than 50 families of deceased (farmers suicide committed) farmers identified from 8 districts of Marathwada. 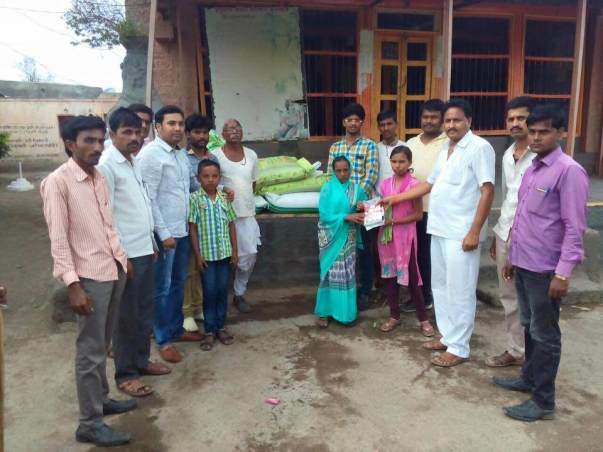 Going right at their doors approximately 6 lakhs has been distributed among these families – to purchase seeds, fertilizers on time. Later in 2016 and 2017, we successfully completed initiatives 'Mission Save Farmer 2016', 'Mission Save Farmer 2017' and in these 2 year we provided assistance to total 18 identified deceased farmer's families from Tq. Partur Dist. Jalna for the complete farming of crop season of that year. As part of these initiatives we have furrowed their farms using tractor, and then provided high quality seeds (Cotton, Soyabean, Toor), Fertilizers and Pesticides - all at free of cost, and most importantly right at their door. The intention behind providing all these things well in advance is to reduce financial burden from their heads and improve their crop productivity by getting things done at right time. This pilot project undertaken in 2016-2017 has been very satisfactory and a exemplary project. 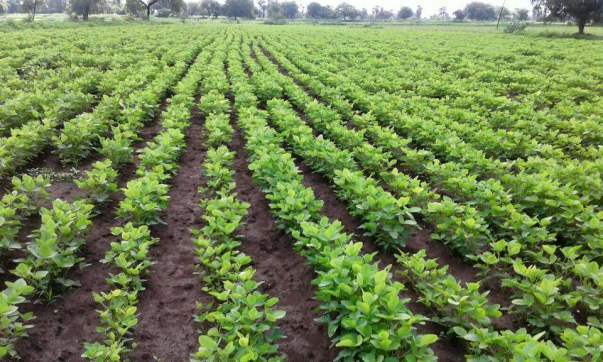 Those 10 farmers have produced total 73 Quintal of Cotton, 55 Quintal Soyabean and 10 Quintal Toor out of 20-22 acres – which would make them earn approximately 6 lakhs in all together. Most important thing is that they have got their confidence back! We are planning for a similar project in this year 2018, to provide complete farming assistance to identified (up to 10) deceased farmer's families for a crop season starting Jun 2018. If we could secure extra/more funding then the number of beneficiary farmers will be increased accordingly, or at least Seeds will be made available to few more farmers. We give preference to families with very weak financial status, average land holding of 2 acre up to 5 acre maximum. Therefore in this project an average 30-35 acre land will be cultivated. At minimum we would need to spend an average Rs. 5,000/- to Rs. 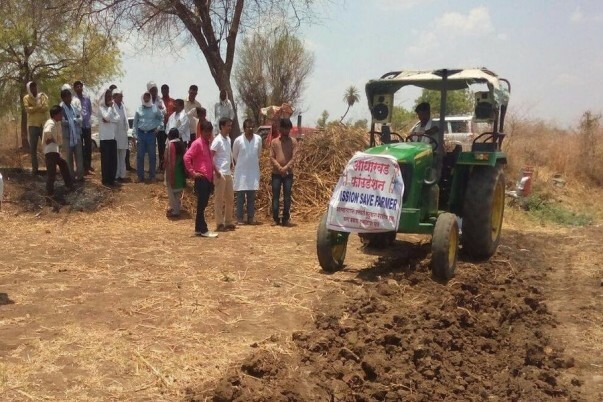 6,000/- per acre to fulfill their basic needs – Farm furrowing, Seeds, fertilizers, Insect pesticides etc. Transportation and other expenditures is additional. Most of our volunteers are social activists who themselves are young farmers and they will work at ground level - directly dealing with identified farmer families. Furthermore, local Government authorities (Hon. 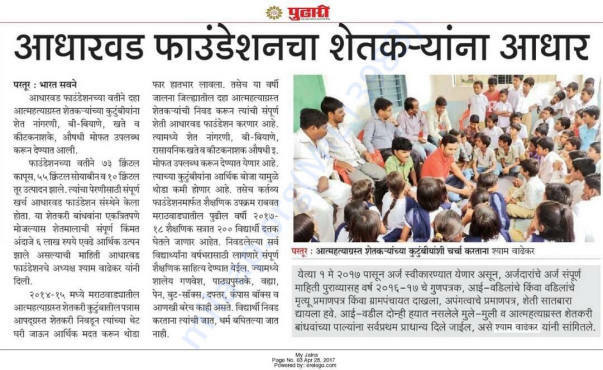 District Collector, Taluka Krushi Adhikari) will provide all required information about farmer suicide incidents along with support, guidance for execution of this project plan. Guys, if this upcoming farming season turns a productive one then they will earn (Zero Production cost) enough profit and their disturbed economic cycle will be back in shape. However unfortunately if it turns in to a bad one, then all their financial loss will be on our account. With this backdrop, the 'Aadharwad Foundation' request for your support and monetary contribution towards this noble initiative. Contribute as little as you can! On 13th Jun 2017, We provided the Seeds, fertilizers to 3 deceased farmer's families at Viregaon Tq. Jalna. These 3 farmers have received 3 Cotton Seeds Bags of Ajit 155, 4 Soyabean Bags of 30 Kg each and 7 Bags DAP Fertilizers in all together. Thanks to all all the contributors and supporters. Thank you for all the love and support. Until now we have already provided help to 4 farmers (expenditure Rs. 22,860/-), and now the similar help will be provided to 3 more farmers on this Sunday 11th Jun. For the same we need to purchase seeds and fertilizers - expenditure Rs. 15,700, and hence we withdrawing this fund received at Milaap at the account of Shyam Wadhekar (Founder-President of Aadharwad Foundation, Partur). Thank you for all the support. Until now we have already provided help to 4 farmers (expenditure Rs. 22,860/-), and now the similar help will be provided to 3 more farmers on this Sunday 11th Jun. For the same we need to purchase seeds and fertilizers - expenditure Rs. 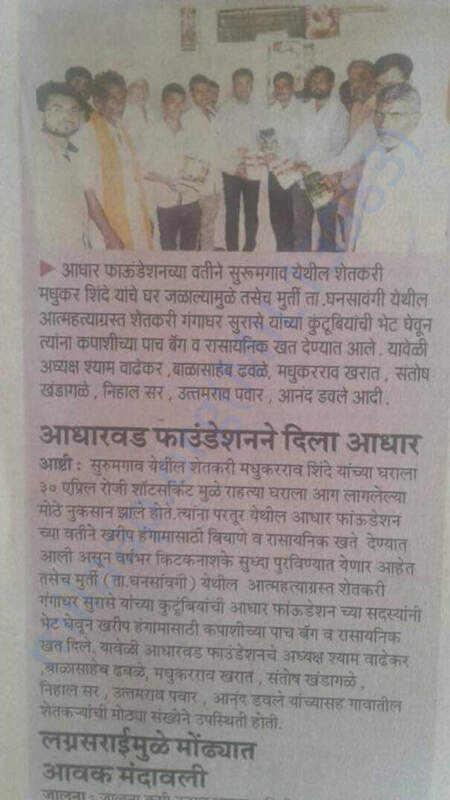 15,700, and hence we withdrawing this fund received at Milaap at the account of Mr. Shyam Wadhekar (Founder-President of Aadharwad Foundation, Partur). 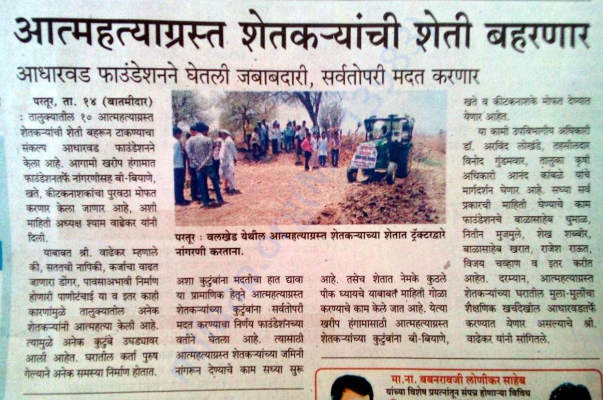 Team Aadharwad, you're doing a very commendable job. Happy to help you in a small way.